FRASIER FRAGRANCE - Frasier Fir will be your new delectable holiday tradition, with a mix of aromatic snap of crisp Siberian Fir needles, heartening cedarwood and relaxing sandalwood. HIGH-QUALITY WAX - Thymes uses top quality food-grade paraffin wax and non-metal wicks to ensure a higher quality color, scent, and a burn lasting up to 15 hours. SET THE MOOD FOR MEMORIES - Refreshing and earthy notes sets the mood for those special moments that make up our life stories, creating a tradition to savor and to share. 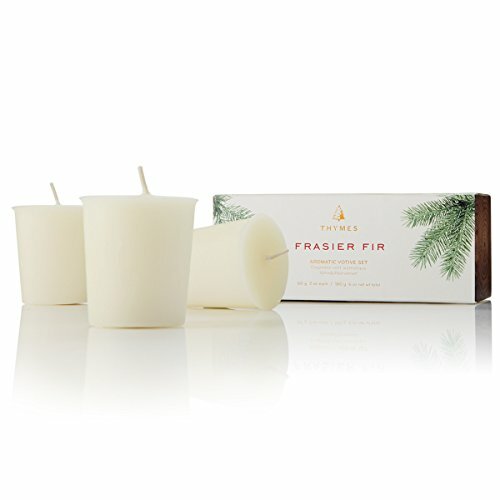 STYLE FOR ALL SEASONS - Thymes Frasier Fir Candle adds calming ambiance with a crisp just cut forest freshness, inviting comfort and style into your home. BEAUTIFUL VOTIVE PACKAGING - The stylish packaging makes a perfect present on its own or in combination with other Thymes products to create a festive basket. Frasier Fir is a tradition that feels right at home. Reminiscent of days gone by, and suggestive of wonderful times to come, Thymes Frasier Fir sets the mood for those special moments that make up our life stories. With the aromatic snap of crisp Siberian Fir needles, heartening cedarwood and relaxing sandalwood, it is mountain fresh, yet cozy and comforting. Bringing forth a feeling of warmth and joy to share with all those who touch our lives.